With more than 100 miles of fence installed around the Dallas/Fort Worth area, we know a thing or two about fence installation. And since vinyl fence is becoming more and more popular, you might have questions about installing a vinyl fence on your own property. If that sounds like you, keep reading while we go over some of the most important things to know about vinyl fences and fence installation. One of the most frequent questions we get is whether we can install fences in the fall or winter. The answer? Of course! Unlike wood fence, which isn’t temperature-stable and can expand or contract in extreme temperatures, vinyl fence remains workable year round. As long as the ground isn’t frozen solid, we will be able to install your fence. Another benefit of installing a vinyl fence on your property is the installation process is fast and painless. Vinyl fences are lighter and easier to work with than wood fence, which makes the installation process more efficient. It also causes less damage to your lawn since the lighter posts and panels won’t damage the grass like heavy wood posts do. If you have dogs or cats in your backyard, vinyl fence is ideal. Vinyl is very resistant to damage from pets including scratching and jumping, and we can even install vinyl “dog boards” below ground level to keep your pets from digging beneath your fence. These boards will never rot or degrade, unlike wood boards, meaning they provide lasting protection and security for your pets and your home. If you’re installing a pool fence, a vinyl fence is the best solution. Unlike wood fence, which can become damaged or stained by splashing water and pool chemicals, vinyl fence is resistant to the wear and tear common to pool fences. It also lasts longer than wood fence and doesn’t require staining or painting. That means you won’t have to shut your pool down to perform fence maintenance, and you won’t have to worry about the fence stain getting where it shouldn’t be. Have a property with a hill or a change in elevation? 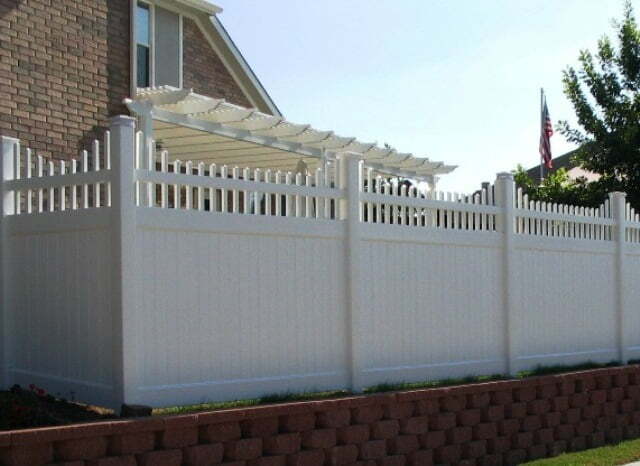 Unlike many vinyl fence manufacturers, we can install custom fence panels that match the slope of your property. This lets you avoid “stepping” your fence and creates a fence that doesn’t have gaps or uneven heights. When we install a vinyl fence, we make sure it’s built to last. One way we do this is by sinking your posts three feet into the ground (instead of 18 inches or two feet, which are standard for most fence manufacturers). We also use more concrete around the post to ensure it is sturdy – nearly 160 pounds per post. Finally, our fence posts aren’t just vinyl sleeves around a wood post, but durable, purpose-built vinyl posts designed to last a lifetime. When you choose Future Outdoors for your vinyl fence installation, you don’t just get a great fence from an experienced installer. You also get a lifetime of support and care. All of our vinyl fence products come included with a limited lifetime material warranty, and the warranty is even transferrable if you choose to sell your home. We guarantee you won’t find the same level of support for any wood fence. Ready to learn more and start your vinyl fence installation? Contact us today at Future Outdoors. Our installers will answer all of your questions and help you decide which style of fence is right for you. Call 972-576-1600 today to begin the process or visit us on Facebook for more helpful tips and advice.